Last week Baby Robert and I embarked on a long walk to our local Walgreens to pick up some dishwashing detergent. We were completely out and the dishwasher had been packed for days. It was starting to emit a pretty nasty smell. Halfway to the store, I realized that I had left my wallet at home. Normally I would have turned around to pick up the wallet and go back out. However, Robert was getting close to his nap time and I didn’t want to miss the window of opportunity for a good nap. We continued on our walk and came home empty handed. While he was napping I did what any modern woman does during her free time, I got on Pinterest. 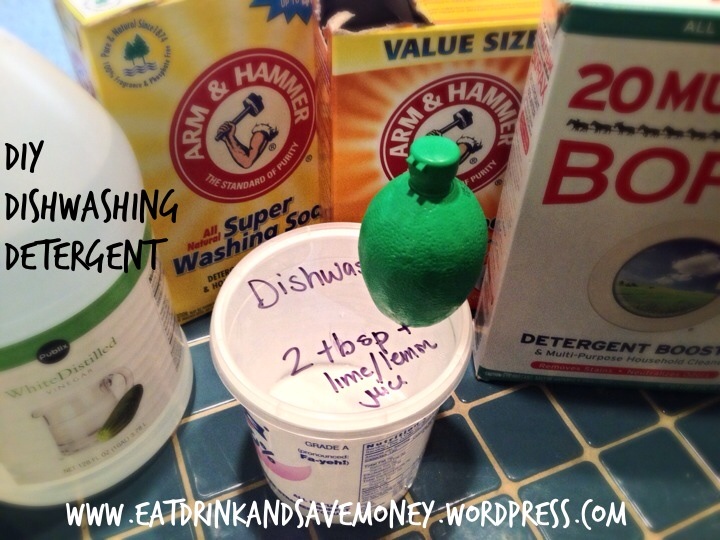 I was determined to find an easy DIY detergent so I could get the dirty dish stench out of my kitchen. This is a combination of a couple different ones I found on various blogs. Most of them called for citric acid, which I obviously don’t have laying around. I found that the store bought lime juice works just as well. Anything citric would work. Mix the first 3 ingredients together and store in an airtight container. Use 2 tablespoons for each wash. Before washing add a couple squirts of lime or lemon juice to the mix. Fill your rinse compartment with white vinegar. I highly recommend keeping Borax, vinegar, washing soda and baking soda in your house at all times. I can’t tell you how many times I have Googled or Pinterested cleaning ideas and these items consistently pop up.